The Da-Lite Lancaster 25" Table Lectern SS blends a rectilinear design with handsome bull nose styling that enhances any presentation venue. With a built-in sound system that includes volume, bass, and treble controls, this lecten packs all the key features into a portable design. An oversized reading space easily accommodates a laptop, a three-ring binder and many other presentation materials. A spacious storage shelf provides room for additional storage. This lectern also includes a mahogany finish, a high intensity reading light and an LED digital clock/timer with countdown capabilities. The versatile design can easily integrate touch panel monitors, additional shelves, cooling fans and a microphone. An oversized reading space leaves space for laptops, three-ring binders and other presentation materials. This lectern includes a sound system with sound controls, two inputs and two outputs. The clean, rectilinear table top design allows this lectern to travel with you anywhere you go. 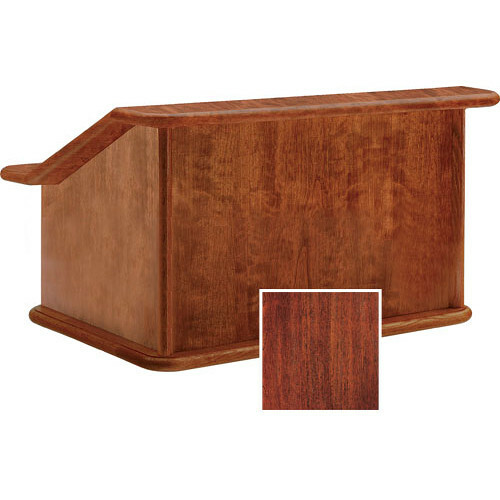 The mahogany finish blends with any conference room decor. Power Requirements 110/120 VAC 3-wire outlet (220/240 VAC models to 220/240 VAC source). Box Dimensions (LxWxH) 38.0 x 38.0 x 28.0"